Nathan James Norman shares why H.P. Lovecraft’s “Cthulhu Mythos” depicts the Day of the Lord. I have a theory. Feel free to disagree with me, but I think H.P. Lovecraft’s Cthulhu Mythos depicts the Day of the Lord. There’s been a resurgence of interest in Lovecraft over the last decade or so. I think part of his resurgence is because this early 20th century writer invited others to write stories within the world he created. In the Cthulhu Mythos, ancient elder gods are in the process of returning to the earth. Humanity is nothing compared to them. We are less than ants. They are so beyond us that to delve into their secret knowledge will cause madness. Their followers are insane. And when the Old Ones return to earth, the best case scenario for anyone is to be eaten first. To be consumed, so as to not suffer under the tortuous madness of their presence. 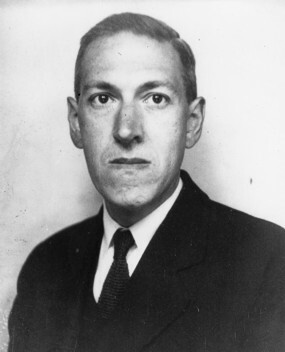 I was introduced to Lovecraft in my undergraduate work and enjoyed reading his horror stories. I think the contemporary stories being told in this mythology often far exceed Lovecraft in his own world. So, what does any of this have to do with the Day of the Lord? Both the Old and New Testaments talk about the Day of the Lord (also the Day of God, or the Day of Christ). Scholars quibble over the details, but ultimately the Day of Yahweh refers to the time in the future when God will bring about final conclusions to the earth. It is an end of this world and a beginning of the world to come. It will be a glorious day!1 Jesus returns to make all things right. The day shall dawn on this dark world and the Lord Himself will rescue his people! But there are two sides to the Day of the Lord. For those outside of God’s grace, it will be terrifying. Isaiah wrote, “Look, the day of the Lord is coming— cruel, with rage and burning anger— to make the earth a desolation and to destroy the sinners on it.”3 The prophets Joel,4 Amos,5 and the Apostle John6 also describe the Day of the Lord as day of ultimate dread. And this brings us back to the horror stories of Mr. Lovecraft. I think what we see in his stories, and those who continue to tell his stories, is the destructive side of the Day of the Lord. It is a metaphor for what the return of Christ will look like for those outside of His grace. It is an image of the madness of ultimate judgment when each and every human is to give account for his or her actions. Now, I’ve floated this theory past my Christian friends who also enjoy Lovecraft and there are two common objections. First, they object on the basis of Lovecraft’s atheism. How could he write about something he didn’t believe in? This has a simple answer: Romans 1. God is understood through his creation. Surely there must be a God who cares about right and wrong. And if flawed humanity cares about justice, how much more will the perfect God? Second, they object that the religious characters in the Cthulhu Mythos are all crazy, mad, and immoral. But in my thesis, Lovecraft is not writing from a Christian’s perspective. He doesn’t see things through the Christian worldview, he’s seeing things through the lens of an unregenerate man. And I’m not sure about you, but as a Christian I am often called crazy, mad, or immoral. Often on the same day. Like I said earlier, I might be wrong here. Feel free to disagree. 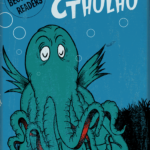 But as a Christian, whenever I read tales set in Lovecraft’s world I cannot help but wonder if maybe, just maybe this gifted author unintentionally revealed his fears about the world to come, and gave us just one more reason to sing “What A Friend We Have In Jesus” as we await that terrifying and glorious Day of the Lord. 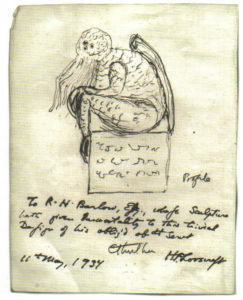 I always wondered why, as an atheist, Lovecraft was obsessed with gods. And never the nice ones–it was always Dagon and his ilk. That’s a good point, Kessie. There’s a number of contemporary writers who are staunch atheists/agnostics who spend an inordinate amount of time exploring the spiritual themes they reject. And I think as a believer it is helpful in a way to understand how people view God. We honor, love, and respect Him so much, we often forget that others hate and scorn Him. It’s easy to classify Lovecraftian horror under a sort of mythic naturalism. Naturalism in the literary sense is the Jack London-y atmosphere of the cruel indifference of Nature. Which I find kinda funny to be invoked here, since quite a few people object to putting naturalism in Christianity. I think that’s another way many people (including believers at time) view God. Detached. Cold. Indifferent. 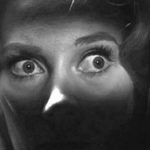 Thank you for sharing this observation and for calling attention to this master of subtle horror, my mentor in terms of suggestion and shuddery subtleness. You are absolutely correct. Proof is found in his story The Call of Cthulhu itself, where Castro wheezes about how the time of the Old Ones’ return will be easy to determine because man will have become like the Old Ones themselves, with lawlessness, murder and riot being the order of the day. And when the Old Ones return, they will show mankind new ways to do those things and the entire world will know ecstatic liberation! The first part of this is straight out of Matthew 24 and II Timothy 3:1ff — Lovecraft was a student of the English Bible and escaped neither its influence on his writing nor its significance in the colonial New England culture he adored. Any reading of The Case of Charles Dexter Ward will tell you that. The return of the Great Old Ones indeed does most definitely echo the Day of the Lord. But where the cultist exults Cthulhu fhtagn, we instead cry Maranatha! Very detailed examples! Thank you so much for providing them. I love your last line too! This is the central concept of my Merkabah Rider series, although from a Judeocentric perspective. In Jewish mysticism it’s forbidden to study the nature of the Ein Sof, that which preceded Creation and the manifestation of God as we know Him. Rahav – A cosmic sea monster first mentioned in the biblical book of Isaiah….Talmud called him Prince of the Sea, echoing the Canaanite name for their sea god, “Prince River.” God slew him when he refused to help in creating the earth. Great article with interesting speculation, Nathan! Thanks for taking the time. Thanks Kerry. It certainly helps to see how non-believers view spiritual things.